The Light Rail project, known as the Réseau électrique métropolitain, is an ambitious infrastructure project set to serve many parts of Greater Montreal including the West Island as well as the North and South shores. That’s great, but it sounds like there’s someplace missing from that list. When the Caisse de Dépot et de Placement du Québec announced the project back in August, they claimed it would be the biggest transit project in 50 years. The population of Montreal’s East End would be ignored. By East End, we don’t mean what’s going on in Hochelaga or Rosemont. We are talking about the districts of Montreal-North and Rivière-des-Prairies-Pointe-aux-Trembles who are constantly overlooked. People will say that the east is perfectly fine the way it is, and it already has a train going there since last year. In fact, the train was meant for the population of Terrebonne and Mascouche. Beyond that, the Agence Métropolitaine de Transport has the three East End boroughs in fare zone three, where monthly bus passes cost the same as off-island suburbs—we do feel you on that one, Sainte-Anne-de-Bellevue. In all, East Enders and people of Sainte-Anne pay $23 more on monthly passes than other Montreal users in zone two and $39 more than zone-one users. It’s quite simple: We’re on the island. We shouldn’t be paying off-island rates. The trains that pass through the East End are few and far between. If you’re not traveling at rush hour, you need to find another way to get downtown or you won’t be traveling at all. Back in 2012, the STM released their plan to add five new stations on the blue line to the east of Saint-Michel: Pie-IX, Viau, Lacordaire, Langelier and Anjou. They wanted to add these stations by 2016. Clearly, that did not happen. In May 2016, the Quebec government delayed the construction of the five new stations. The former Minister of Transport, Jacques Daoust, seemed to suggest that the government’s short-term financial interests would be better served by the REM. While it is true that the east has access to express busses, these busses are often crowded, and take you to metro stations outside of the borough. On average, it can take around an hour to get downtown with public transport—and that’s on a good day, when there is no snow and ice. In terms of public service, allowing more public transit to the East End, and particularly Montreal North, would be a great thing. In a 2013 study, Centraide found that Montreal North is “densely populated,” with over 7,500 people per square km. The study also found that “29 per cent of the population, or 24,000 people, live below the low-income cutoff compared to 23 per cent for the Island of Montreal. Some sectors have even higher rates: 41per cent in the northeast and 36 per cent in the southwest.” Making public transit more available to these densely populated areas with a higher rates of poverty just makes more sense. Municipal opposition leader Valérie Plante has proposed a new metro line as part of her campaign. 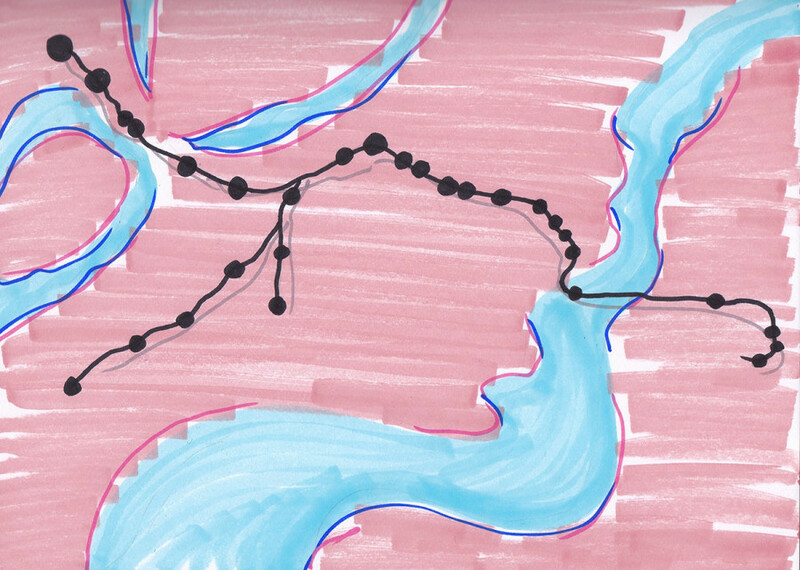 The pink line would run downtown and cut northeast in the city, with stops in Saint-Michel—another East End borough—and Montreal North. The line would consist of 10 or 12 stops, and would be built over 25 years, finishing in 2042. While Plante estimates the plan could cost around $6 billion, it is a potential solution to the East End’s issues. There is no denying that the West Island is also underserved by public transport, but is the REM really the solution? There are several environmental concerns with the project, and it just doesn’t seem worth it. In an interview last fall, Concordia urban planning expert Jochen Jaeger stressed that the REM will likely cause urban sprawl. Some of the stops are located in protected farmland. As part of their project, the Caisse also plans to construct 13 large parking lots around the stations. “Of course the logic, or the argument, that people will make is that people go there by car and then they use public transport rather than going by car into Montreal, but that also means you can still work in Montreal and live far outside […] it’s a no brainer,” Jaeger said. Trainsparence, a coalition of environmental and transport groups, opposes the REM. According to the group, the light rail train stops are located in areas with smaller populations, and in higher income areas, completely avoiding the East End. The orange and green lines are also too concentrated and the REM project would not do anything to fix that. Then there is the cost. The Caisse has not yet released their possible fares, but in places that already have a light rail system, fares are practically unaffordable. Take the TransLink in Vancouver for instance, prices there range from $91 to $170 for a monthly pass. We’re not saying that the West Island doesn’t deserve the REM and that they shouldn’t have upgrades in their way to commute. That said, in a typical East End way, we are complaining. But this time we actually think that the complaining is worth it. We are tired of being ignored out there where the east ends.